Last week’s news release on personal income included new statistics for the second quarter of 2017, along with data revisions for the period 2014-present. The latest update showed personal income increasing 0.6% in the second quarter, slightly below the national growth rate of 0.7%. Data from the first quarter were revised to show an increase of 2.0% for Arkansas, up from the 1.0% rate previously reported. For the four quarters from 2016:Q2 to 2017:Q2, Arkansas’ growth rate was 3.0%. For the same period, the nation’s income growth rate was 2.9%. 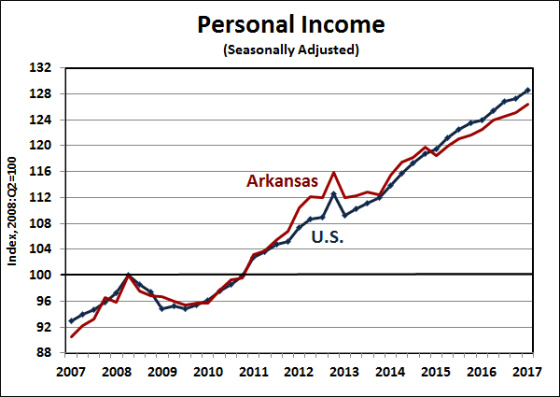 After adjusting for an inflation rate of 1.6% (as measured by the price index for personal consumption expenditures), the real year-over-year growth rates of personal income for Arkansas and the U.S. were 1.4% and 1.3%, respectively. The breakdown of personal income growth in the second quarter reveals that nonfarm income rose 0.9%, while the more volatile farm income component decreased by 15.2%. Among the major sources of income, both Dividends, Interest, and Rent and Wage and Salary Disbursements increased 1.2%. 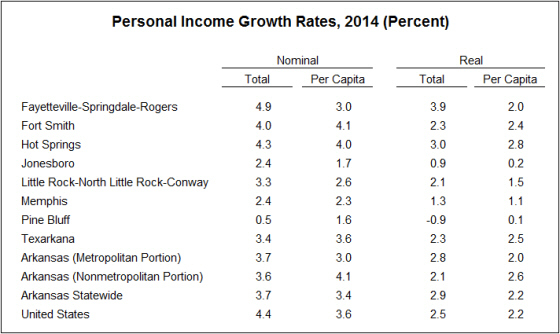 On a year-over-year basis, Arkansas’ 3.0% growth rate reflected a surge in Proprietors’ Income (+7.8%). Arkansas’ growth rate also outpaced the nation in Earnings by place of work (3.3% compared to 2.9% nationwide). 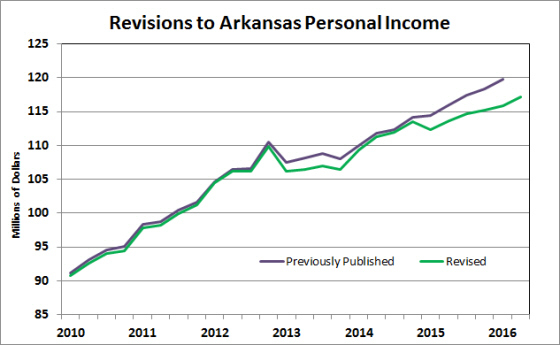 Overall, the annual revisions to the personal income data for 2014-16 raised estimates of Arkansas incomes. The revisions had the effect of raising total personal income by 1.0% in 2014, by 2.0% in 2015 and by 1.0% in 2016. The bulk of the revisions were attributable to Dividends, Interest and Rent. Cumulatively, that component was revised upward by 10.7%. Personal Current Transfer Receipts were revised upward for 2016 (by 1.0%), but for all other categories of income (including Wage and Salary Disbursements), the cumulative effect of revisions was negative. 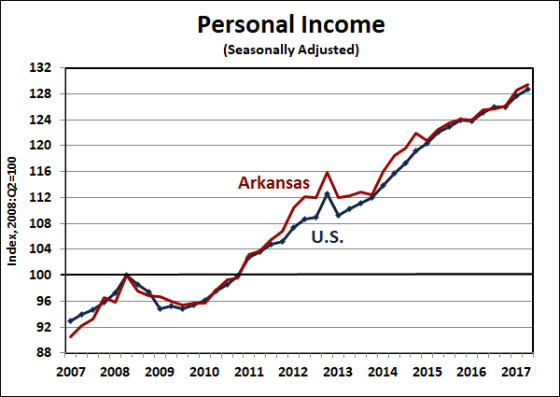 We had previously noted that while personal income growth in Arkansas has roughly kept pace with the national average in recent years, its growth has been skewed in favor of the Dividends, Interest and Rent component while Wage and Salary income has grown more slowly than the national average. The new data revisions exacerbate that differential. As shown in the table below, Wage and Salary income has accounted for just over one-half of national personal income growth over the course of the economic expansion. Here in Arkansas, however, Wages and Salaries account for less than 40% of total income growth. In contrast, Dividends, Interest and Rent accounts for over one-third of Arkansas income growth and only 26% at the national level. 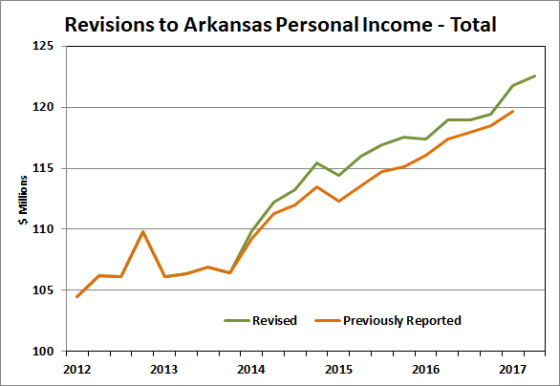 The other component that has been contributing a relatively large share to Arkansas income growth is Personal Current Transfer Receipts. The growth rates of transfer payments have been roughly the same for Arkansas and the U.S., but that component represents a larger share of total income for Arkansas. 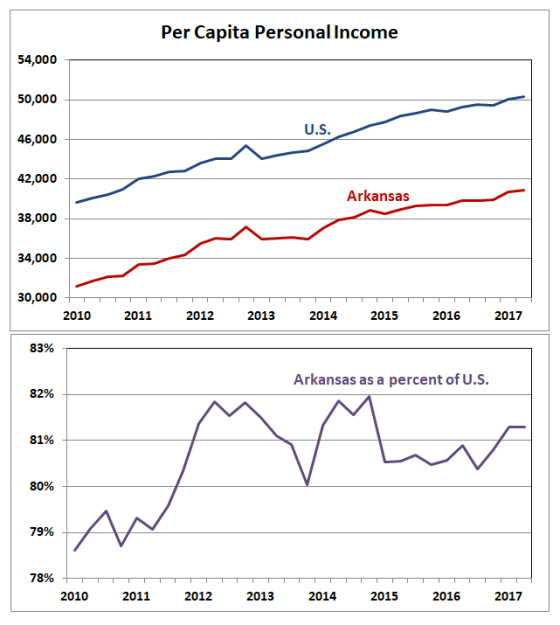 Arkansas per capita personal income in the second quarter was $40,893, representing 81.3% of the national average per capita income of $50,308. As a percent of the national average, the recent data revisions improved Arkansas standing: Before the revisions, per capita income stood at 79.4% of the national average (in the first quarter). It was the cumulative effect of data revisions for 2014-16 that raised estimates for Arkansas back above the 80% line. Arkansas personal income increased by 1.0% in the first quarter of 2017, the same pace as the national average. The range of growth rates among states ranged from -0.1% in Nebraska (the only state with negative growth) to +1.6% in Idaho. From the first quarter of 2016 to the first quarter of 2017, personal income in Arkansas increased 3.1%, compared to a 3.7% growth rate nationwide. 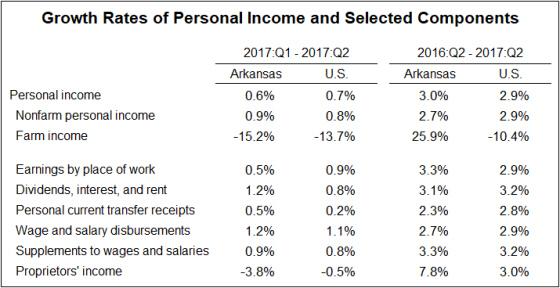 From the recession trough-date of 2010:Q1, income growth has averaged 4.0% in Arkansas and 4.2% for the U.S.
As shown in the table below, Arkansas farm income rose sharply in the first quarter. The news release from the Bureau of Economic Analysis indicated that farm earnings was a leading contributor to growth in Idaho, the fastest growing state in the first quarter, but was also a leading contributor to slow growth in other states. The divergence in the contribution of farm income to growth reflected different types of farm output among states. Proprietors’ income also increased sharply in Arkansas in the first quarter, although the growth rate of that category has been slightly lower than the national average over the past four quarters. Although personal current transfer receipts expanded at a rate of only 1.0%, compared to 1.5% nationwide, that category represents the only major component of personal income to outpace the U.S. average over the most recent four quarters. Earnings by place of work, which comprises about two-thirds of personal income, increased 1.23% in Arkansas in the first quarter, slightly outpacing the U.S. growth rate of 1.07%. 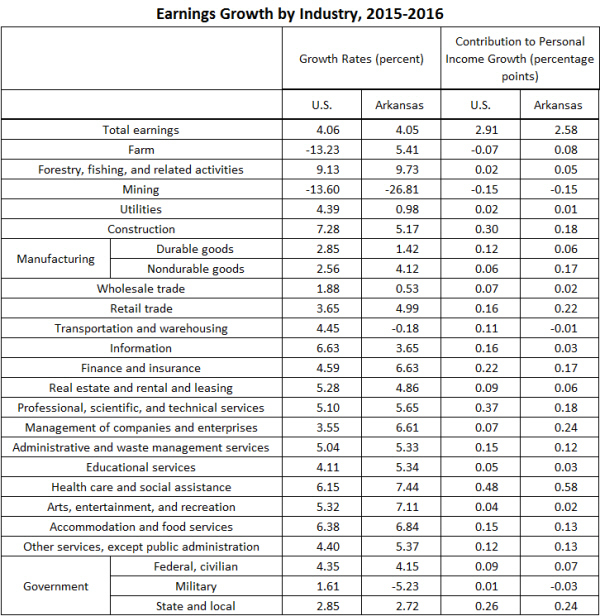 For the most part, sectors seeing a decline in income in Arkansas were also slow-growth sectors nationally–these included forestry and fishing, transportation and warehousing, information, and management of companies and enterprises. In addition to farm income, the fastest growing industry groups included mining, construction, real estate, educational services, and administrative and waste management services. Arkansas is a relatively low income state, but it is also a state with a very low cost of living. A dollar of income supports more real spending in Arkansas than it would in other, more expensive parts of the country. New data from the Bureau of Economic Analysis documents the low cost of living in Arkansas using measures known as Regional Price Parities (RPPs). 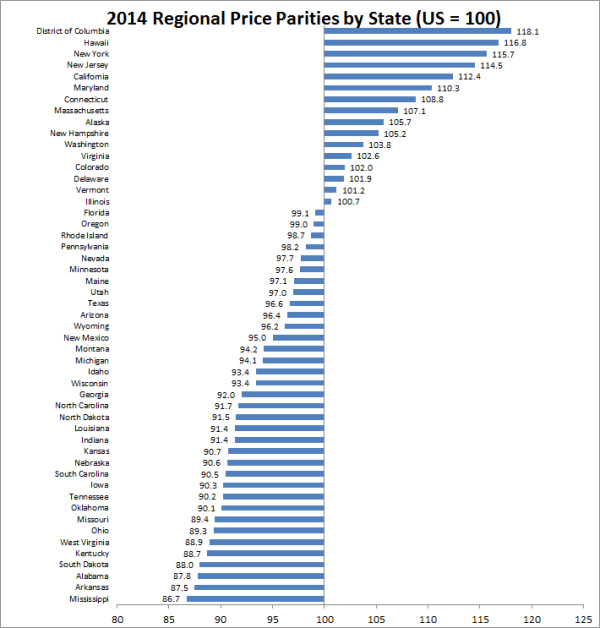 RPPs measure the average price of goods and services in a geographic region compared to other regions in the U.S. The figure below displays these measures for the 50 states and the District of Columbia, as of 2015. The most expensive state in the nation is Hawaii, with prices that are 18.8% above the national average. At the other extreme, the cost of living is only 86.2% of the national average in Mississippi, almost 14% below average. Arkansas comes in at #3 on the list of states with the lowest cost of living, with a RPP of 87.4. While the cost of living is lower in all areas of the state, there are differences among the RPPs for regions within Arkansas. As shown in the following table, the cost of living is highest in the Northwest and Central Arkansas metropolitan areas. 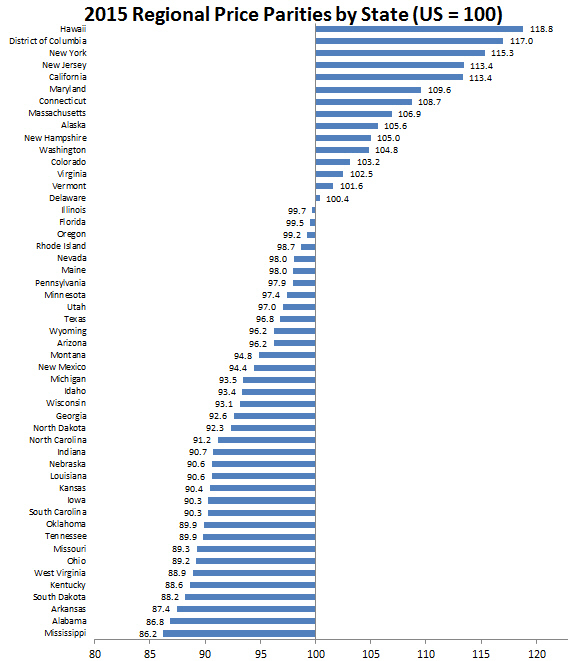 Nonmetropolitan areas of the state have a RPP of 83.9, implying a cost of living that is 16% below the U.S. average. Among metro areas, Jonesboro is the least-expensive place to live. In fact, Jonesboro’s RPP ranks it with the 7th lowest cost of living among all 382 of the nation’s metropolitan statistical areas. The table also shows that differences in rents–or housing costs more generally–drive the overall differences in cost of living. Goods prices tend to vary relatively little in different parts of the country. The cost of services, which have a significant locally-produced content, vary more substantially. Rents, on the other hand, are entirely local prices and therefore display the largest region-specific component. By adjusting incomes in states and regions for differences in cost of living, RPPs can be used to calculate measures of purchasing power that provide real (price-adjusted) measures of income. Typically the term “real income” is used to describe measures that are adjusted for inflation, or price differences over time. In the context of RPPs, the adjustment covers differences over both time and space. In the latest data, for instance, the RPP for Arkansas rose from 87.1 in 2014 to 87.4 in 2015. Because the RPP for the entire U.S. is 100, by definition, this means that prices in Arkansas rose by 0.3 percentage points more than for the nation as a whole. U.S. inflation was 0.3% in 2015 (as measured by the implicit price deflator for personal consumption expenditures) so Arkansas’ inflation rate was about double the national average for that year. Actually after rounding to the nearest one-tenth of a percentage point, the inflation rate implied by Arkansas regional price deflator was 0.7%. Other states’ regional price adjustments indicated inflation rates ranging from 1.2% in North Dakota to -0.7% in Delaware. 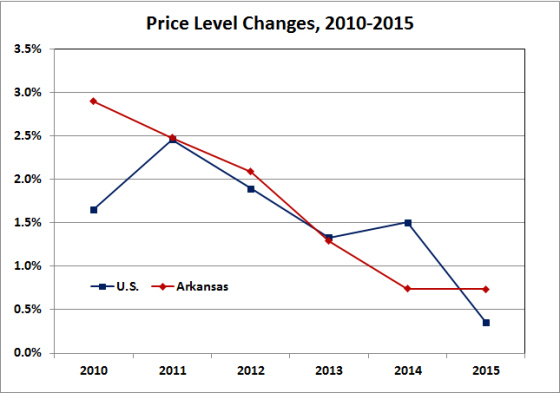 The figure below illustrates the varying path of price-level changes in Arkansas compared to the national average. The U.S. the data are annual percent changes in the implicit price deflator for personal consumption expenditures. 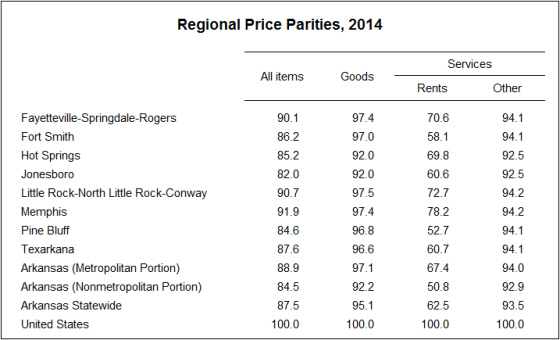 For Arkansas, the data represent implicit price deflators based on the annual RPP statistics. The two measures of “inflation” track fairly closely over time. Over the five-year period, cumulative compounded price changes totaled 9.5% for the U.S. and 10.6% for Arkansas, implying that the cost of living in Arkansas was rising slightly toward the national average, on net. 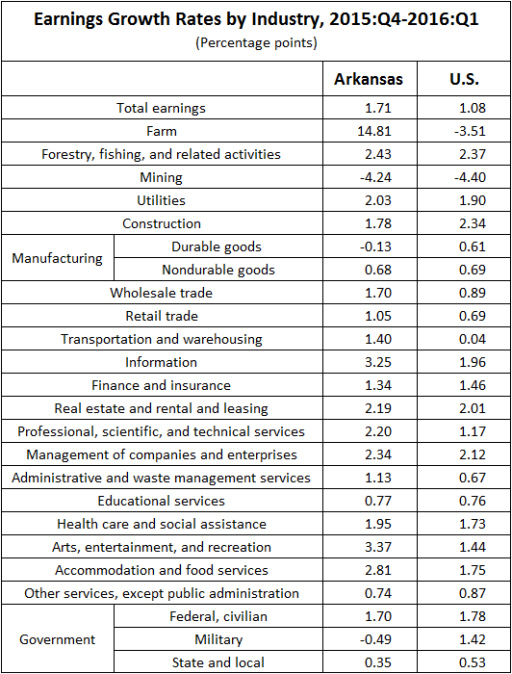 The following table shows the growth rates of total personal income and real personal income in Arkansas, adjusted for differences in inflation and regional prices. The table decomposes total income growth from 2014-15 into real and inflation components (the percent growth columns). For Arkansas statewide, nominal (dollar) income rose 2.2%, with 1.4% attributable to real income growth and 0.7% to overall price increases (with the remainder due to rounding error). The highest real income growth rate in the state was in the Fayetteville metro area, with 3.7% nominal income growth and 0% inflation. Nominal income in Pine bluff increased only 0.1% in 2015 but prices declined by 0.5%, resulting in an increase in real income of 0.6%. One commonly used measure of local economic well-being is per-capita personal income. In dollar terms, per capita income in Arkansas was $38,257 in 2015, which amounted to just under 80% of the national average. When we take into account the higher purchasing power of incomes in Arkansas, real per capita income is over 91% of the national average. The table below shows how the adjustment for purchasing power changes the relative standards of living implied by per capita incomes in Arkansas’ metro areas. The accompanying figure illustrates the differences among areas. 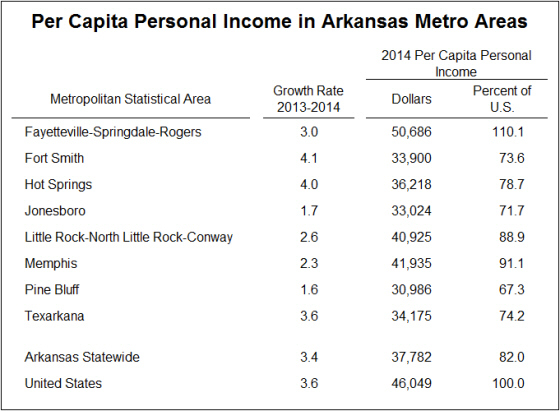 The highest per capita income in the state is in the Northwest Arkansas metro area. In dollar terms, per capita income is 9% above the national average. After taking account of the fact that the cost of living is over 10% below the national average, per capita income in the Fayetteville metro area is 22% above the national average–in terms of purchasing power and standards of living. The very low cost of living in Jonesboro has a particularly large impact on this real income comparison. In dollar terms, per capita income in Jonesboro is only 70% of the U.S. average, but after adjusting for prices it amounts to 86%. Arkansas personal income increased by 0.8% in the fourth quarter of 2016, a slightly slower pace than the nationwide growth rate of 0.9%. From the fourth quarter of 2015 through the end of 2016, income growth in Arkansas was 3.2%, compared to 3.7% nationwide. Since the beginning of 2010, incomes in Arkansas have been rising at a 4.1% annual rate, slightly below the 4.3% U.S. pace. The personal income report from the Bureau of Economic Analysis featured data based on 2016 annual averages. From 2015 to 2016, personal income in Arkansas grew at a 3.2% rate — a growth rate that ranked 27th among the 50 states. Across the country, growth rates ranged from -1.7% in Wyoming to 5.9% in Nevada. Total earnings by place of work expanded at nearly identical rates in Arkansas and the U.S. in 2016 — 4.05% and 4.06%, respectively. The table below reports a breakdown of earnings by industry. For both Arkansas and the nation, the sector contributing the most to earnings growth was Health care and social assistance. Several other service sectors showed relatively strong growth as well. The weakest sector for earnings growth was Mining — reflecting the ongoing slump in fossil fuel prices and extraction activity. A surprisingly strong sector was Construction, which grew at a 7.3% nationwide and 5.2% in Arkansas. With a population growth rate of 0.3 from 2015:Q5 to 2016:Q4, personal income per capita in Arkansas grew at a 2.9% rate. U.S. population growth over the same period was 0.7%, resulting in a per capita income growth rate of 3.0%. In the fourth quarter of 2016, U.S. per capita income stood at $50,207, while Arkansas’ was $39,725. 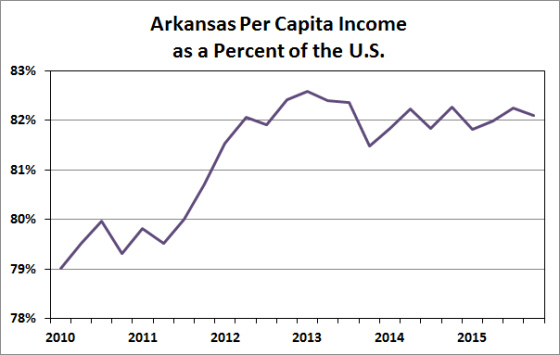 As a percent of the U.S., Arkansas’ per capita income ended the year at 79.1%, down slightly on net from a year earlier. 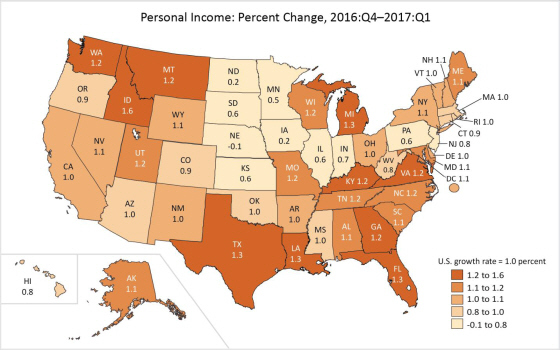 Personal income increased by 0.9% in Arkansas in the third quarter, a slightly smaller increase than the nationwide gain of 1.1%. Percentage changes among the 50 states fell within a relatively narrow range, from +0.4% in Oklahoma to +1.4% in South Dakota. Arkansas’ growth rate ranked #41. 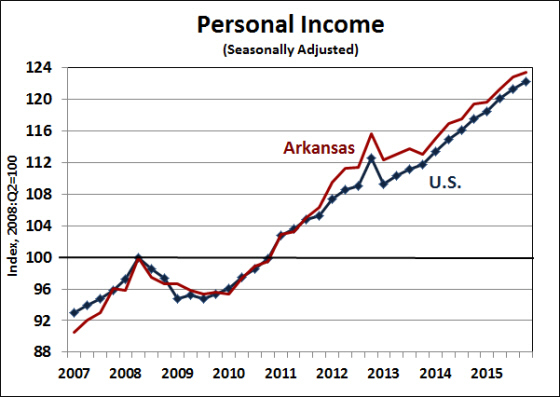 Over the most recent four quarters, Arkansas personal income increased by 3.3%, compared to a 3.5% increase for the U.S. Over the course of the current economic expansion (from 2010:Q1), Arkansas income growth has averaged 4.2% while the U.S. average has been 4.3%. 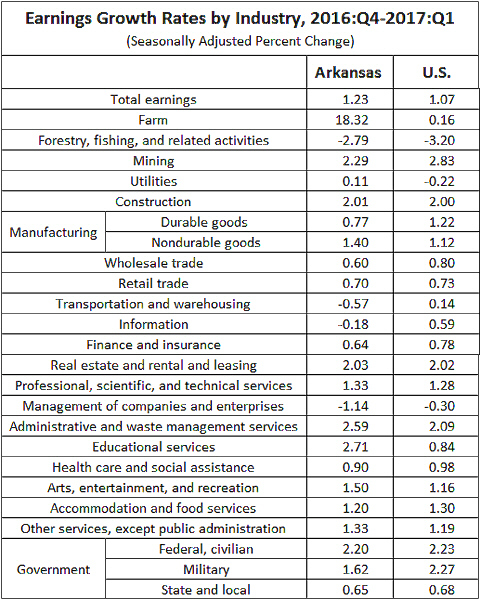 Net earnings rose 1.1% in Arkansas and 1.3% for the U.S. 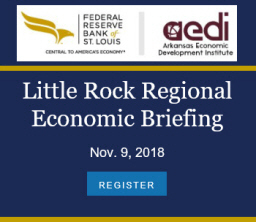 This morning’s report from the Bureau of Economic Analysis noted that earnings “was the leading contributor to growth in personal income in most states.” Income from dividends, interest, and rent was also an important contributor for Arkansas, as has been the case throughout the current expansion. Earnings by sector: Earnings growth in the third quarter was strongest in service-providing sectors, although growth was spread fairly evenly across sectors. The categories of Farm income, Mining, and Forestry were the only sectors with negative income growth. Income in the construction sector showed an encouraging 1.1% rate of increase in Arkansas. On a per capita basis, Arkansas personal income increased 0.8% in the third quarter, a slightly smaller increase than the U.S. average of 0.9%. At $39,602, per capita personal income was 79.7% of the U.S. average ($49,681), down one-tenth of a percentage point from the 79.8% reading in the second quarter. New data from the Bureau of Economic Analysis shows total personal income in Arkansas increasing by 1.1% in the second quarter, up from a growth rate of 0.6% in the first quarter (revised). The second quarter growth rate slightly exceeded the national average of 1.0%, and represented the 16th highest growth rate among the 50 states. Compared to a year earlier, Arkansas personal income was up 3.1%, compared to 3.2% nationally. The second quarter increase represented gains in all major income categories: Wages and Salaries increased by 1.3%; Proprietors’ income was up 0.8%, Dividends, interest and rent rose 1.1%; and Personal current transfer receipts increased 1.7%. A breakdown of earnings by industry shows gains in most of Arkansas’ sectors. One clear exception was mining, which has been impacted by low oil prices. The BEA report noted that lower earnings in mining was the leading contributor to below-average earnings growth in several of the slowest growing states (which are also significant oil-producing states). Earnings growth was also negative in Construction, Educational services, as well as in the leisure and hospitality services sectors. Today’s report incorporated annual revisions to the personal income data. 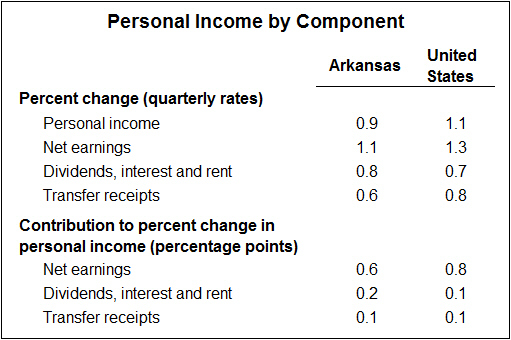 For Arkansas, the revisions represented fairly substantial downward adjustments to income. 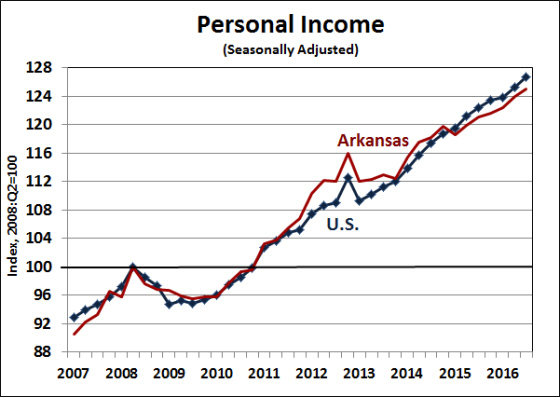 As illustrated in the figure below, Arkansas personal income was revised down by 1.5% in 2013, by 0.5% in 2014, and by 2.2% in 2015. The revisions were primarily attributable to new figures for Proprietors’ income, as well as Dividends, interest and rent. The BEA reported that nonfarm proprietors’ income, in particular, was subject to substantial revision due to methodological improvements that were implemented with this revision. The data revisions had a particularly noticeable impact on measured income growth in 2015. As previously reported, the data showed a growth rate of 3.6% from 2014:Q4 to 2015:Q4. The revised data now show that increase to be only 1.5%. 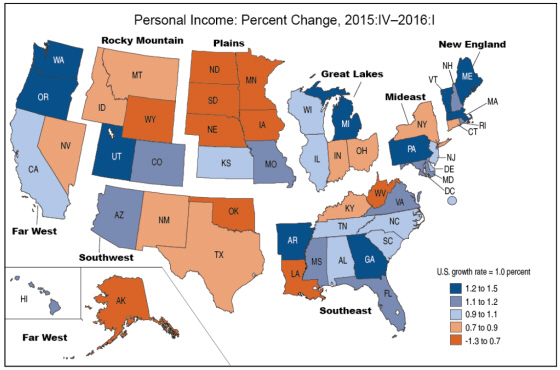 The Bureau of Economic Analysis released new figures on real personal income for states and metropolitan areas yesterday. The data contain a wealth of information on incomes, prices and standards-of-living. They are based on a relatively new dataset calculating “regional price parities,” (RPPs) which measure differences in the prices levels of goods and services across states and metropolitan areas. 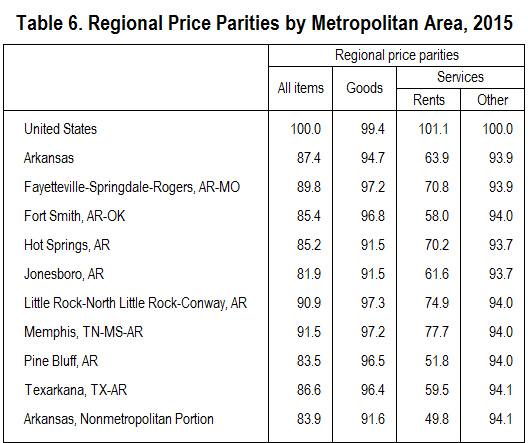 Essentially, RPPs serve as a measure of relative price levels among states and metro areas. The newest data, which apply to 2014, show that the cost of living in Arkansas is the second-lowest in the nation. The RPP for Arkansas was 87.5, down from 87.7 in 2013. This number can be interpreted as saying that the cost of living was 12.5% below the national average in 2014. Because prices in Arkansas are among the lowest in the nation, the purchasing power of incomes in Arkansas is far closer to the national average than nominal (dollar-denominated) incomes would suggest. In 2014, per capita personal income in Arkansas was only 82% of the national average–ranking the state #43 among the 50 states plus D.C. After adjusting for differences in the cost of living, however, real per capita income in Arkansas was 93.9% of the national average–implying a ranking of #34. 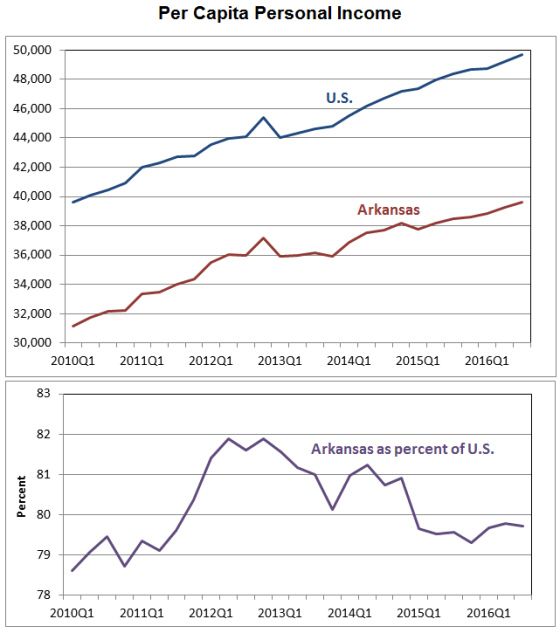 The slight down-tick in the RPP for Arkansas (from 87.7 in 2013 to 87.5 in 2014) can be interpreted as indicating a lower rate of inflation in Arkansas than the national average. The U.S. inflation rate in 2014 (as measured by the Personal Consumption Expenditures Price Index) was 1.4%. The implied regional price deflator for Arkansas increased by only 1.2%. Hence, the state’s 3.7% growth rate of nominal personal income translates to a real (inflation-adjusted) growth rate of 2.5%. For the U.S., the nominal growth rate of 4.4% implied a real growth rate of 2.9%. The composition of Arkansas’ low RPP is typical of other low cost-of-living states: Prices for goods are near the national average, but the prices of services — especially rents — are far below the norm. This is not surprising, of course. Goods can be transported and sold with little marginal expense. Services are not so transportable. In fact, in the jargon of international trade, services are often classified as “non-tradables.” Statewide, the RPP for goods in Arkansas was 95.1%, implying that prices of goods were only 4.9% below the national average. The RPP for non-rent services was 93.5, while the RPP for rents (which also proxy for home prices) was only 62.5. As shown in the table below, there is considerable variation among RPPs in Arkansas metropolitan areas. Overall RPPs range from 91.9 in Memphis to a low of 82.0 in Jonesboro. The cost of living in Jonesboro–18% below the national average–is the fifth-lowest in the nation. While there is variation in RPP price-levels around the state, all RPPs in Arkansas are below 100, implying below-average costs. This also translates to higher purchasing power. As shown in the table below, the Fayetteville-Springdale-Rogers metro area is the only part of the state where dollar-incomes are above the national average, with incomes in Pine Bluff at less than two-thirds of the norm. After RPP adjustment, incomes in all parts of the state (other than Northwest Arkansas) are closer to the national average. Changes in RPPs for different metro and nonmetro areas around the state also differ, implying variation in inflation rates. In economic terms, it is the real inflation-adjusted growth rates of income that matters. 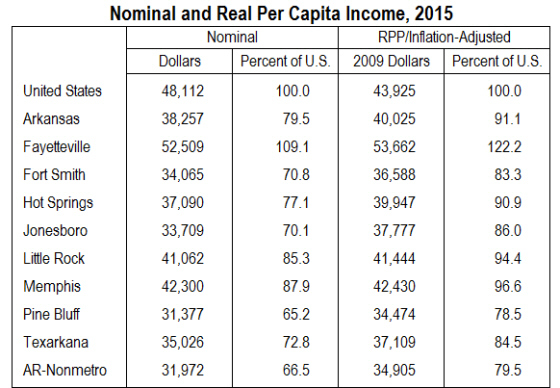 The table below shows both nominal and real income growth for the metro and nonmetro areas of Arkansas. 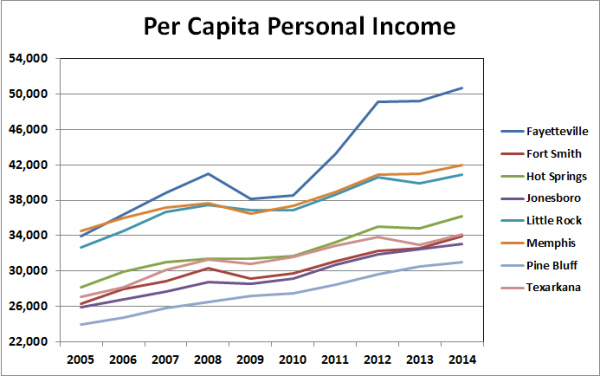 Note that the differences between total income growth and per capita income growth reflects changes in population. Much of the total income growth in Northwest Arkansas represents population growth that has accompanied general economic expansion. On the other hand, total real income growth in Pine Bluff was negative, but the losses in income reflected declining population. 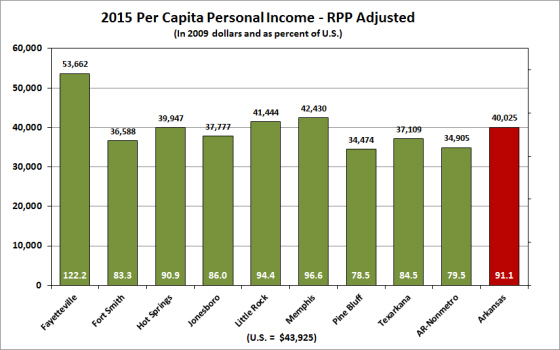 In per capita terms, real income in Pine Bluff remained approximately unchanged from the previous year (+0.1%). Arkansas personal income expanded 1.2% in the first quarter of 2016, outpacing the national average of 1.0%. The highest growth rate in the nation was Washington state (1.5%), with Arkansas’ growth ranking the sixth-highest among the 50 states. All major components of Personal Income showed positive growth in the first quarter, led by a 17.1% increase in Farm proprietors’ income. Wages and salaries grew at a 1.4% pace, while Dividends, interest and rent expanded by only 0.3%. Total earnings expanded 1.7% — a higher growth rate than any other state except Washington. The table below shows the growth rates of total earnings by industry, showing that Arkansas’ strong performance was largely attributable to the gain in Farm income. Mining (including oil and natural gas extraction) was the weakest sector for both Arkansas and the total U.S. The news release from the Bureau of Economic Analysis noted that mining income had experienced its 5th consecutive quarterly decline, falling 15.8% nationally since the fourth quarter of 2014. Over the same period, mining income in Arkansas contracted by 17.4%. Arkansas’ growth outpaced the nations in most sectors, particularly in service-providing sectors. However, earnings in durable goods manufacturing declined slightly in Arkansas, in contrast to a small gain nationwide. 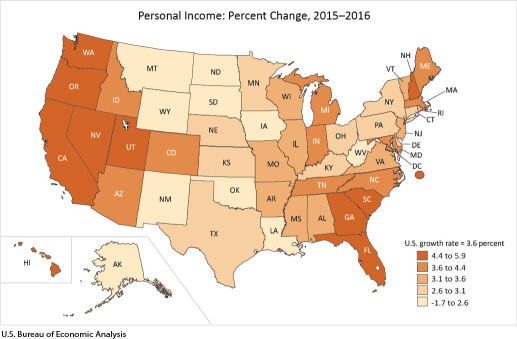 New data on state personal income shows that incomes in Arkansas grew by 0.5% in the fourth quarter of 2015, compared to an increase of 0.8% for the U.S. From the fourth quarter of 2014 through the fourth quarter of 2015, personal incomes rose by 3.4% in Arkansas and by 4.0% nationwide. Inflation, as measured by the price index for personal consumption expenditures, rose by 0.5% over the year, so real (inflation-adjusted) incomes rose by 2.9% in Arkansas and 3.5% nationwide. On an annual average basis, personal income rose by 3.9% in Arkansas, somewhat lower than the nationwide growth rate of 4.4%. Arkansas’ growth rate ranked number 26 among the 50 states. 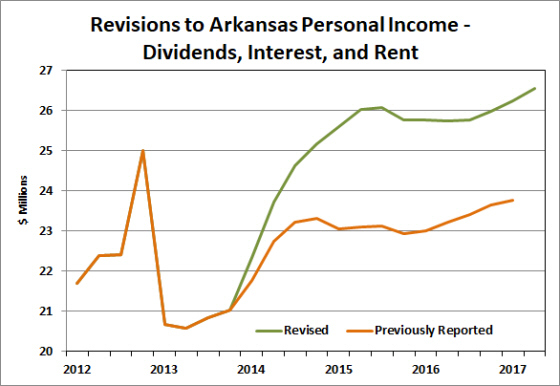 Total earnings by place of work, which excludes Dividends, Interest & Rent; and Personal Current Transfer Receipts, expanded by 3.2% in Arkansas and 4.2% for the U.S. The table below breaks down the growth rates of earnings by industry. Farm incomes were down in Arkansas, but declined by much less than the national average. Earnings in the mining sector were down all around the nation, reflecting low oil prices. Earnings in durable goods manufacturing were also down slightly in Arkansas, in contrast to a 2.0% nationwide growth rate. Areas of strength–particularly in Arkansas–included Forestry, Fishing, and Related Activities; Accommodation and Food Services; and Construction. Arkansas’ per capita income in 2015 was $39,107, representing about 82% of the U.S. average of $47,669. 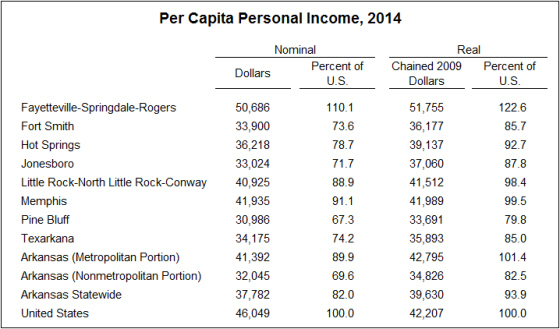 Arkansas ranked 41st among the 50 states in per capita personal income. 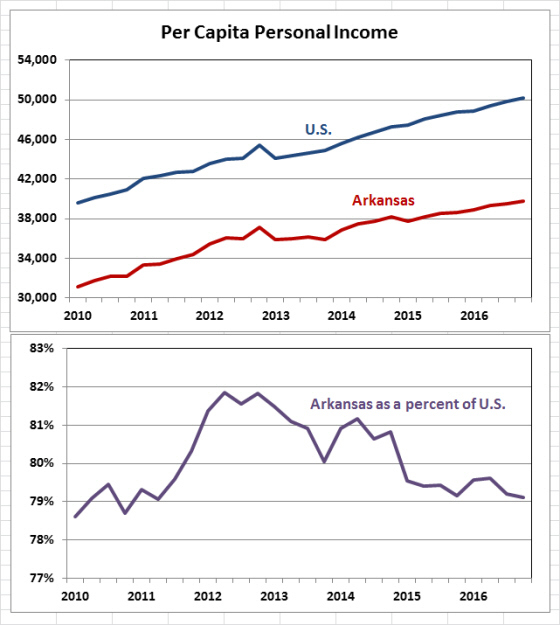 As shown in the figure below, per capita income in Arkansas was less than 80% of the U.S. average during the early stages of the economic recovery, rose to 82% during 2011 and 2012, and has remained at approximately that relative level since then.